Ford’s new Fiesta ST – it’s coming! 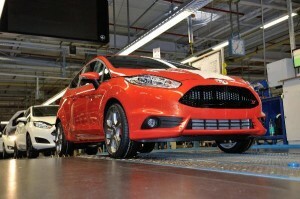 Ford has started production on its new Fiesta ST – its fastest ever production Fiesta. There must be something about the British market because half of the car’s production is heading to the UK. Ford is expecting to sell 5,000 STs every year and it follows in the footsteps of the Fiesta’s previous sporty iconic incarnations, the XR2, XR2i, RS1800, RS Turbo as well as the first generation ST. It now looks like this one will be launched in the USA and Asia Pacific too. Buyers can expect a car that will sprint from 0-62 mph in just under seven seconds thanks to the firm’s 1.6litre EcoBoost petrol engine. It should still return around 48mpg. The Fiesta ST features unique honeycomb mesh grille, dramatic rear diffuser and, for the first time, Recaro seats as standard. Production has just begun at the Ford plant in Cologne, Germany, and is the result off development by Ford’s Team RS which develops high performance vehicles for the company. The result is a stylish car that handles well and has a top speed of 136.7mph. The designers have had to tweak the Fiesta’s chassis with new steering, suspension, braking components, configuration and tuning. There’s also an enhanced version of Ford’s Torque Vectoring Control system, and a three-mode Electronic Stability Control system which helps help the car under control and make it a rewarding driving experience. The Ford Fiesta ST goes on sale in April priced at £16,995. Try leasing the Fiesta ST and see how much you could save. I’m thinking ‘quite a lot’. This entry was posted in Car Updates & Releases, New Cars, Small Car, Sports Car and tagged Asia Pacific, caption, car, Driving Experience, electronic stability control, ford, Ford Fiesta, ford fiesta st, Germany, LS, New Ford, new Ford Fiesta, price, seat, speed, Sport, ST, Torque Vectoring Control, UK, USA by Steve Lumley. Bookmark the permalink.